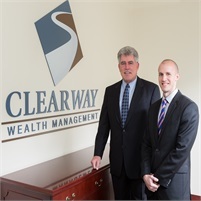 ClearWay Wealth Management serves business owners and professionals, their employees, retirees and families in an effort to deliver their desired financial outcomes. We do this by inspiring our clients to establish their lifetime goals, by designing and implementing personalized strategic solutions with them, and by keeping their financial lives simple and organized. Our high level of service allows them to focus on those areas that give their lives purpose. Our staff consists of experienced professionals with a "hands on" approach to financial guidance. Not only will you find our team members knowledgeable, but you will also discover that our staff truly cares about helping you work towards your dreams. As your financial professionals, we will do everything in our power to keep you focused on where you want to go, advise you on how to work toward getting there, and continually remind you of the importance of maintaining a disciplined approach in working towards your dreams.